Associates Insectary ships millions of predators and parasites in hundreds of shipments to growers across North America each year. Associates raises Cryptolaemus Mealybug Destroyer beetles, Anagyrus mealybug parasitic wasps, N. californicus mites and Aphytis melinus wasps at its Santa Paula, California facility. 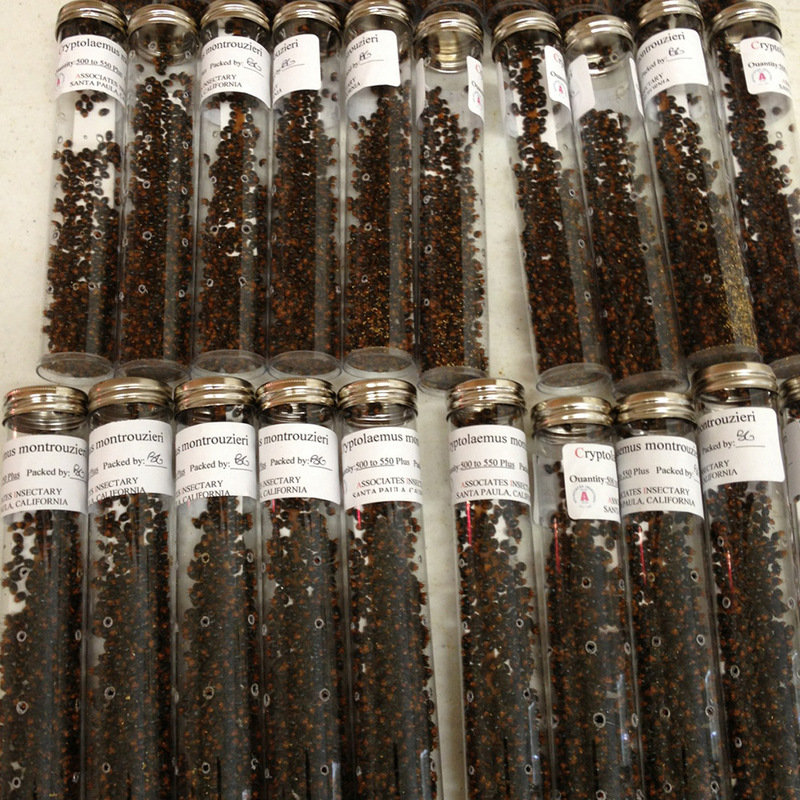 All of these beneficials are hand-raised by our skilled staff to provide ample supplies of fresh, high quality insects for shipment to buyers across North America on a year-round basis. Because all of our beneficials are raised on live prey, they retain their pest hunting skills better than insects raised on a non-specific artificial diet. 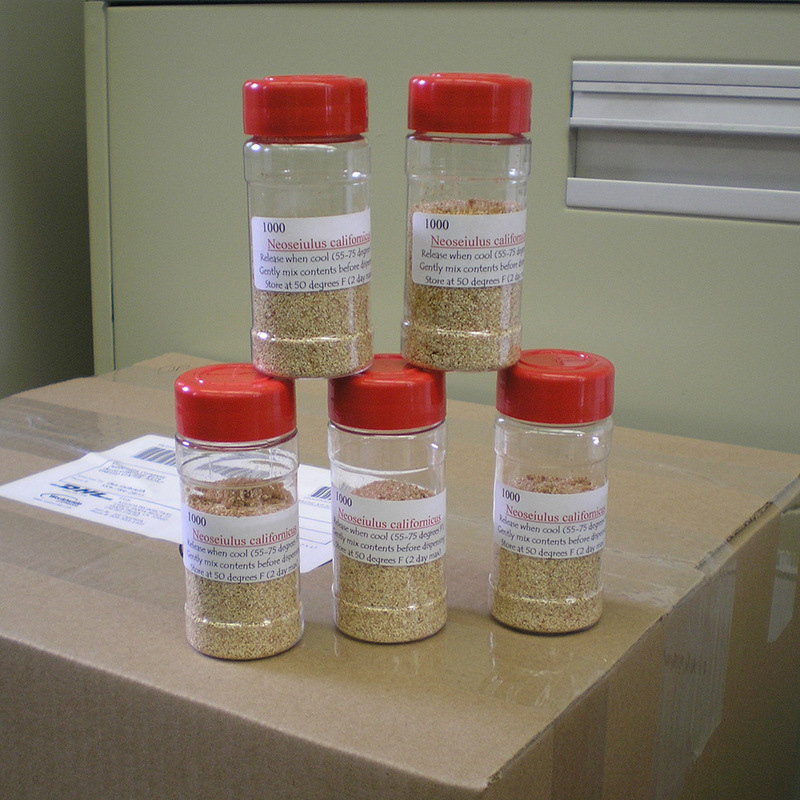 Orders are shipped weekly, using overnight express methods to assure minimal insect stress during shipping. If UPS or FedEx delivers to your location overnight, Associates can ship to you. Primary Producer For 90 years, growers combating mealybug pests in their crops have relied on Associates Insectary as the oldest and largest producer of Cryptolaemus Mealybug Destroyer beetles in North America. These beetles are highly effective at reducing high levels of mealybugs and are much less bothered by ant activity in the crop than parasites. Associates is continually increasing and improving its beetle production to meet the rising demand from growers beyond Southern California. Associates’ skilled staff can specially pack shipments sent to growers in every climate zone imaginable. Associates’ high production standards and quality control assure healthy and hungry mealybug predators are delivered to growers anywhere, any month of the year. Valuable Mealybug Parasite Associates also produces Anagyrus Mealybug parasitic wasps. These highly specific parasites only feed on certain mealybugs, but are highly valued by any growers who combats vine, citrus or other mealybugs these wasps attack. These parasitic wasps compliment the use of Cryptolaemus beetles by seeking out small pockets of mealybugs when these pest populations may be too small to be attractive to the Cryptolaemus beetles. The effectiveness of this wasp can be greatly diminished if ants are active at the release point. Due to the high demand for these delicate wasps in the spring, pre-order requests are strongly encouraged for timely shipments. Spider Mite Predators Associates hand-raises N. californicus predatory mites which are effective at controlling a number of different plant pest mites. Californicus mites are quite hardy and capable of surviving on pollen when low pest numbers would cause other types of predatory mites to die out. Associates ships these mites to growers of a wide variety of crops which require control of pest mites when higher temperatures reduce the effectiveness of other predatory mite species. Associates Insectary is familiar with the needs of large-scale growers because as a grower-owned cooperative, providing practical pest control for commercial growers is its primary function. Our grower-owners depend on Associates to produce high quality insects and to deliver them to their farms in a healthy state. Associates knows that other growers expect the same excellence in the insects they receive. Associates is becoming the primary supplier for more growers each year. For pricing quotes or additional information, contact billing@associatesinsectary.com.